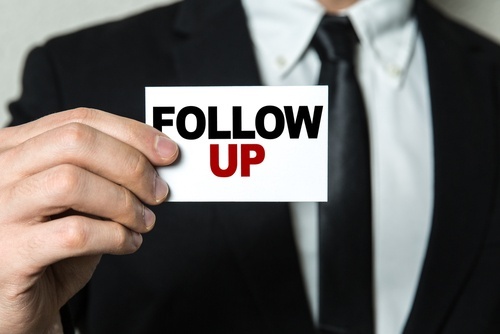 Did you know that 48% of salespeople never follow up with a prospect? That is a staggering percentage of potential business that is being missed out on. Now let me ask you this - would you consider being a real estate agent a sales job? Following up with prospects is important in order to build a relationship so that eventually, when the prospect is ready, you can gain their business. It is important to follow up with a prospective client via email immediately after you speak to them and reiterate what your conversation was about. Just like you, your prospects have a lot going on and confirming what you spoke about in writing is incredibly helpful. This also provides a paper trail for the future if you ever need it. Go the extra mile to help your prospect or show you’re willing to help them with anything that they need. Perhaps your prospects need a lender that can process their paperwork in a hurry. Connect them with a lender that you know can get the job done and will also be willing to go the extra mile to help them with budget if they need it. Consider what the average agent would do for a prospect and take that to the next level. Provide them a service that no one else can. The home buying and selling process can be quite overwhelming. There needs to be the right balance of pushing a prospect towards their ultimate goal, but doing so without coming off as too pushy or overzealous for business. Being too pushy after your follow up is a HUGE turnoff and can push a prospect away from you completely. You already gave them your pitch, and you followed up - now you just provide them with information that can be useful to them. Perhaps you came across some statistics that you think would interest them. Maybe you have information on certain neighborhoods that they said they were interested in. your job after the initial pitch is not to keep pushing your services, it is to be helpful and to let them come to you. One of the first things that you should be talking about with an agent is what they are looking for in a home. Share some listings that have those features they are looking for. This will show your prospects that you were paying attention when you talked and show that you are interested in them. Following up with your real estate prospects is something that too many agents forget to do. The sad truth is that following up is one of the simplest tasks that you do as an agent and yet has such a profound impact on the outcome of your meeting. Maintain control of the situation by following up with your prospective clients. Are you struggling to generate real estate prospects from social media? Let us help you!